Media Agency Group CEO Lee Dentith was invited to provide an interview for the upcoming issue of Asia OOH. I am extremely proud that Asia OOH magazine have acknowledged Media Agency Group’s role as a pioneering and knowledgeable presence in the UK outdoor advertising market. Asia OOH magazine is a professional publication that is dedicated to the global outdoor advertising sector, exploring industry developments and guiding the activity of agencies, brands and media owners in the Asia-Pacific region. The magazine has gradually constructed its reputation as a reliable and influential source in the outdoor market, thanks to frequent international insight from leading figures in out-of-home advertising. 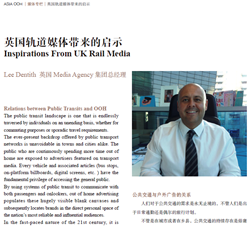 Media Agency Group CEO Lee Dentith was invited to provide an interview for the upcoming issue of Asia OOH, focusing on the relationship between the outdoor industry and rail and train advertising media. Click here to view PDF article.